National Register of Historic Places by The United States Department of the Interior. The Aquitania, known legally as the 5000 North Marine Drive Corporation, was built by Ralph C. Harris and Byron H. Jillson in the Classical Revival style. Its developer was George K. Spoor, the co-founder of Essanay Studios and a producer of silent movies during the first two decades of the twentieth century. At that time, Chicago rivaled both New York City and Hollywood in film production, and Spoor was able to use his considerable wealth to plan and develop a property, which he felt was befitting the celebrities connected with Chicago’s growing entertainment industry. A legend, which purports that Essanay Studio actors Charlie Chaplain and Gloria Swanson once resided at The Aquitania, is likely unfounded. This probable factual inaccuracy reflects nothing more than film lore since all silent film production left Chicago’s Essanay studios for southern California by 1918 at the very latest, and The Aquitania was not built until 1923, although there are historical accounts of both silent-film era stars staying as guests at The Aquitania when it was a hotel in its earliest days. 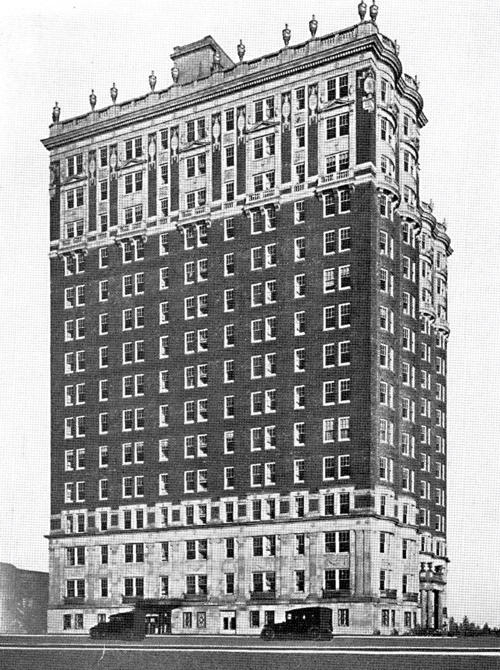 When the Aquitania was built, it was situated directly on the Lake Michigan shore; subsequent development of both Lake Shore Drive and the lakefront park have moved the shore some two blocks east of the building. The fifteen-story building has a courtyard and an Art Moderne lobby. Construction was completed in 1923, and it became a cooperative in 1949.